As the summer months come to a close, it’s time to prepare for returning to school. That means stocking up on school supplies, clothes, shoes, backpacks, and more. Don’t forget to do your homework on common back-to-school scams. Scammers commonly use phony free offers or gift card giveaways to con consumers. On social media sites you’ve no doubt ran across posts claiming by liking and sharing you can win $50 or $100 gift cards to popular retailers like Target or Wal-Mart. Or you may see posts from celebrities claiming giveaways of prizes or money just by clicking a link, sharing or liking a post. These are fake and simply click-bait. By participating, users offer scammers an open invitation to gather personal information about you that they can later use to steal your identity, money, or commit other nefarious acts. They can also lead you to click links that can harm your device by installing malware or a virus. Don’t fall victim by sharing, liking, or clicking on these links. Textbooks can be very expensive. You may be tempted to search online for a free download to save some money. Or, in preparation for an exam you might seek out sample test questions and answers online. Be careful when downloading pdf files or other content from unknown sources. This can also lead to downloading malware and infect your laptop or device with programs. Before you decide to download anything, think about whether or not you should trust the site. If you are even slightly concerned, it’s best to avoid hitting the download button. Instead, check auction sites, eBay, or the school message board to see if former students are selling older copies of the textbook. Another alternative, see if a fellow student is willing to go in with you to pay for a book that you can share. If you need help with upcoming exams, consider getting a tutor or start a study group. In recent years, grant and scholarship scams have been on the rise. BCA commonly receives complaints from consumers who have been duped by “free” money scams. The con artist use deception to lure people into paying “fees” to supposedly cover application fees, taxes, or some other made up cost. They often disguise their identity claiming to represent government agencies, reputable educational institutions, and private organizations. They are all a ruse to either get your money or get you to reveal personal information so the schemers can victimize you financially. The funds don’t exist. Keep in mind you should not have to pay for a grant. Legitimate companies never guarantee or promise scholarships or grants. 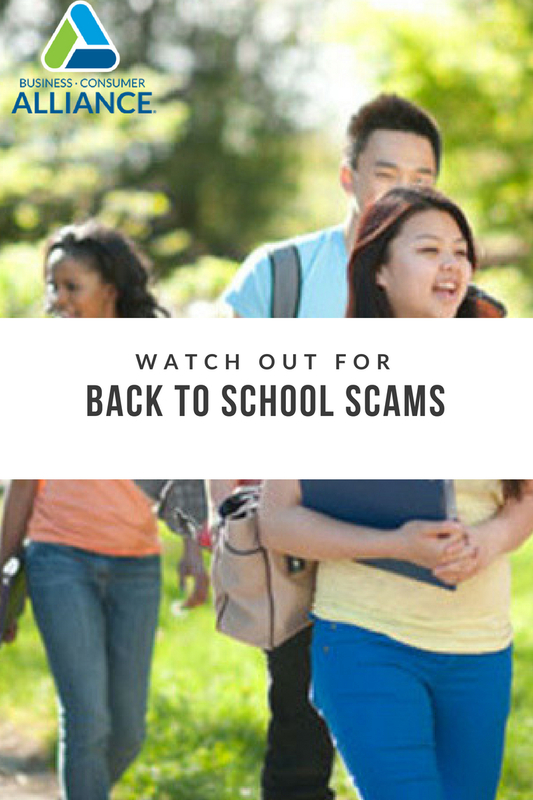 Also, some scammers offer to process your financial aid application for a fee and ask that you provide them with your Federal Student Aid (FSA) PIN. It doesn’t cost you anything to apply for financial aid. You should never allow anyone access to your FSA PIN, which is equivalent to your signature on any documents related to your student loan. If you need assistance, speak to your school counselors, visit the institutions financial aid office, or contact StudentLoans.gov. Check out our articles “Grants for School and How They Work” and “5 Ways to Pay for College” for more information. It is always wise to do some research before you dive into any offer. Always remember these words of advice, “Before You Pay, Check BCA”. We provide Reputation Reports on a variety of businesses that including complaint history and consumer reviews. You can also contact us directly to check out an offer, an opportunity, or to get advice. Just email us, contact us on social media, give us a call at (909) 825-7280, or use our Ask the Experts forum. We also have resources like BCA’s Online Shopping Tips, blogs such as Is This a Scam?, and complaint mediation services if you run into a problem with a business or want to report a scam. Keep up to date on trending topics, scam warnings, tips, and guides by following us on Facebook and Twitter. Don’t forget to share the information with others so they are on alert and don’t fall victim to scam. Nicole Pitts is a Senior Business Analyst and Editor for Business Consumer Alliance. She has been with the organization for 12 years and specializes in report writing, business evaluation, and investigations. Nicole corresponds with businesses regarding complaint trends and provides suggestions to help them alleviate problem areas that may cause concern. She also conducts advertisement reviews, reports on government enforcement actions, and assists government agencies and the media in obtaining information. She enjoys reading, movies, and spending time with her family. Nicole can be reached by email at npitts@checkbca.org.